One women says to Leela that he is in Yuvraj? Anita’s son, he was behind Twinkle before and now he is behind younger sister, it's like buy one sister and get one free, Mahi says please people dont say like this, we are already married, we did marriage in London, one women says that Leela has given too much freedom to daughters, if Mahi is pregnant too? Leela ask them to not say like this, Yuvi says i wont let Leela or Mahi get insulted like this, i agree that Mahi and me married but Mahi is pure, she was in london but she never crossed her lines like her mother, i didnt touch her, see Leela, she remained without her husband till now but no one pointed fingers at her, Mahi is very homely and innocent girl, what if your daughter was in this position? you all should think how Leela must be feeling, you are women and insulting another women like this? Leela is surprised, women says we should leave, Yuvi says just listen one more thing, i and Mahi are getting married again, women leave, Yuvi says to Mahi that see how this lover will take his lover by getting married to her, he looks at Leela and thinks that my mission is a success, Leela will bring Mahi’s proposal for me. Anita asks Twinkle if she is ready? Twinkle says i will make trump card with me to break Yuvi and Mahi’s marriage, Anita does hi-five with her and leaves, Twinkle says i know its bad to break anyone’s marriage but i have to save Mahi from Yuvi. Kunj comes in and thinks that i have to talk about canada to Twinkle, Twinkle asks Kunj to wish her luck, he asks why? she says i am going on some work, Kunj says i have to talk about something, Twinkle says i am in hurry, jsut wish me luck, Kunj wishes her luck, Twinkle says we will talk later, she is about to leave but Kunj holds her and moves his hand on her back, Twinkle thinks why Kunj is getting close to me? and why am feeling goosebumps again? whats happening? Kunj closes her shirt’s zip, Sajna ve plays, he whispers to Twinkle that you should eat less, you are coming out of clothes, Twinkle pulls him away and says this is your serious talk? she thinks why he is so irritating? she leaves, Kunj says i couldnt say it even now. All come to Sarna house, Leela asks Kunj why did Twinkle call us all here? Kunj says even i dont know, Yuvu comes there too. A pregnant girl comes there, Babee asks her who is she? Twinkle says this is Yuvi’s truth which Yuvi wanted to hide, Yuvi had affair with this girl, Yuvi used her, took advantage of her and when she became pregnant then Yuvi left her, she asks girl to speak up, girl says its true, this is Yuvi’s child, Yuvi is confused, Mahi says no, this is all lie, this cant be true, Twinkle says Yuvi is fraud and liar, its good that you know the reality, he made this girl pregnant and ranaway to London, Mahi says no i dont agree, Yuvi cant do this, Twinkle says dont worry, i am with you, you throw this Yuvi out of life, Mahi hugs Yuvi and says my Yuvi cant do this, this is lie, Yuvi says you have to be strong, Yuvi says to Twinkle that if you have said it then how can i deny it? this child is mine, all are shocked, Yuvi says if i agree that this child is mine then if i kiss this girl infront of everyone then it shouldnt be problem for girl, girl says infront of all? Yuvi says its very normal, give me a kiss, he moves closer to girl, girl says stop it, this is not your child, i am sorry, Yuvi asks girl to say truth, girl says Twinkle asked me to say this lie to everyone, she gave me money and i agreed to do this drama, Twinkle says i didnt give you money, girl says i am saying truth, Yuvi asks girl to leave, girl leaves, Mahi asks Twinkle why you wanna separate us? why you are behind Yuvi? Yuvi think that i wont let Twinkle destroy my plan, Twinkle says trust me Mahi, that girl told me Yuvi made her pregnant, Yuvi takes off this shirt and starts beating himself with hunter, all are shocked, Yuvi says to Twinkle that i have given you pain thats why you are doing this with me, so pain for pain, i will pain to myself so that you will allow me to be with Mahi, he beats himself and says to Twinkle that i am sorry, give me chance to prove my love for Mahi, Mahi asks him to stop it, i have done mistake of loving you too, your family didnt accept me too so beat me too, Yuvi says i cant beat yoy, i love you alot, he says to Twinkle that forgive me, he beats himself more. RT asks Yuvi to stop it, RT says anyone can think whatever they want about you but for me, you are like my son from now on, i will do Mahi’s marriage with you, Twinkle says you cant do this, Mahi’s life will be destroyed, Yuvi is fraud, Kunj asks her that we should leave, Twinkle says to Kunj that tell RT this is all all wrong, Yuvi smirks to her and thinks that you cant play with me, i couldnt be your husband but now i will make you mine by becoming your brother in law, Mahi says let us live, when i came here, i thought emptiness of my life will go away after meeting you but now i feel i shouldnt have met you, Twinkle says dont say like this, i love you alot, Mahi says my sister wants to break my marriage, what should i say? it would have been if i didnt have any sister, Twinkle runs from there, Leela asks Kunj to go behind her. Kunj comes out of house and sees Twinkle sitting in garden and crying. Kunj comes to Twinkle, he asks why did you come here? Twinkle says let me be alone, i wanna cry for sometime, Kunj says tension will not go away when you are lone, you wanna cry then you can in room, you can break things there too but i cant leave you here alone, Twinkle says that you think that this is joke, my sister thinks i am jealous of her, that girl twisted her words when i wanted to reveal Yuvi’s truth, you are not in my place so you cant understand, leave me alone, she starts to leave but Kunj holds her hand, he says i cant leave you alone, i have held your hand for life so how can i leave it like this? i promised you to be with you in bad and good phase, i am not in your place but i can understand your pain, you have tears in eyes but heart is my wrenching, when you are sad, i get worried, when you are restless, my peace goes away too, dont say again that it doesnt matter because it does, alot, he pulls her closer, she looks in his eyes, Agar tum saath ho plays, she looks away, Kunj leaves her, Twinkle leaves from there. Twinkle comes to Anita, Anita says i know you are thinking that i lied to you but truth is that child is of yuvi’s only, i dont know why that girl lied, Twinkle says to Anita that i did mistake by trusting you, you are Yuvi’s mother afterall, i will do everything alone now, Anita says you are not understanding that this is all done by Yuvi only, he must have trapped that girl against us, Twinkle says what you think that you and Yuvi will become successful by making me fool? i will do everything alone now, i will save my sister from Yuvi now. Yuvi hugs Mahi and says please clam down I am fine. He smirks at Leela. Kunj says I tried to talk to twinkle about setting up in Canada but I couldn’t. Leela says you have to talk to her. Twinkle comes in and says what are you saying? Leela says I want you and kunj to go to Canada. I want you to have a new start with him there. Twinkle says you decided this about me and didn’t even inform me? Kunj says I was about to tell you. Twinkle says how can you even imagine that I will leave mahi with yuvi. I wont let her ruin her life. RT comes in and says you wont do anything. I have decided that I will get yuvi and mahi married. Twinkle says don’t do this, this will be a wrong decision. Yuvi comes in and says you can wait if you want. Twinkle says you will wait all your life I wont let this happen. RT says I can give yuvi a chance. Tomorrow yuvi and mahi will get engaged and I want you all to attend it, this is my final decision. Yuvi smiles and leaves. Leela goes out as well. Twinkle says papa can’t do this, I couldn’t help her. Kunj hugs her he says don’t worry. I am with you. She says her life will be ruined. The song ‘agar tum saath ho’ plays. Kunj says don’t worry I will handle everything. Next morning, Twinkle sees in dream, yuvi says you weakness your sister with me and you will lose. Now see how I ruin mahi’s life today. Twinkle wakes up in shock. She sees Kunj talking on call. She says Kunj I wont go to Canada. He says I can’t see you this way every day. She says I wont go anywhere. I can’t leave mahi alone. He says ma papa are with her. Nothing wrong will happen. Twinkle says you know yuvi, how can you be so selfish. He says I am selfish because I care about you, you are worried all the time. Yuvi can’t change. Twinkle says i am fine. He says yeah I can see. She says I care about mahi, I can do anything for her. Even shake hand with anita. Kunj says you didn’t even tell me. She shouldn’t be trusted. She says I thought you would help me but you wanna take me away from everyone. I can’t let yuvi ruin mahi’s life. Twinkle comes downstairs, yuvi says this anger is not good for health. Why are you upset? You should be happy. Your sister is getting engaged today. Twinkle says get lost. He says is this how you talk to your ex and brother in law? You should be in your house and help my sasu maa in preparations. Twinkle says don’t fly so much I wont let this happen. he says you will stop? If mahi’s relation is broken, she wont get married anywhere.. because tonight same will happen to mahi like happened to dropati. Twinkle says don’t even think about harming her. Yuvi says I am Yuraj, stop me if you can. Mahi says maa see this sari, Yuvi brought for me. He cares so much for me. Leela says in heart yuvi what is right and what is wrong. Twinkle comes in, she says mahi will wear sari in the engagement? I have to stop mahi. Twinkle says this is so pretty. You should wear a lehnga. You will look old in sari. She says yuvi broght it for me. Twinkle says i have a lehnga you will love it. She says yuvi wants me to wear this. Twinkle says let me show that to you. Mahi says no I will wear this. Mahi says this is yuvi’s plan to humiliate you, you can’t wear this. Mahi says I knew you would do this. You can’t see me happy. You are making a plan against yuvi. Twinkle says try to understand. Please don’t wear this. Mahi says I will wear this. Twinkle snatches the sari from mahi and cuts it. Mahi says what have you done? She is crying. Twinkle says sorry but I did this for you. RT and leela come in. Mahi says see what twinkle did. She torn my sari apart. RT says just leave from here. Twinkle says please listen to me. RT says get out twinkle. Mahi says see what she did? Leela says in heart yuvi has mixed poison among them. Engagement starts. RT is busy in preparations. Babbe comes in, Leela welcomes them. RT says I hope we will leave all old problems with this new relation. Anita says of course, congrats leela. Leela says same to you. Leela says where are kunj and twnikle? babbe says they are coming. Yuvi says where is mahi? Leela says she is getting ready. Kunj and Twinkle come in as well. Mahi comes downstairs. She is wearing the same sari. Yuvi smirks at twinkle..
Leela says mahi how you wore this? it is torn. Mahi says twinkle tear it. Yuvi gave it to me with love. Leela says come. Kunj asks twinkle you did this? She says yes, yuvi threatened me. He said that he will humiliate mahi. And mahi was not listening to me. Kunj says he cant do anything here. He is playing mind games with you. RT says come lets take a family photo. Anita says to twinkle, we can stop this wedding, if we shake hands. RT says to Leela lets start the engagement. 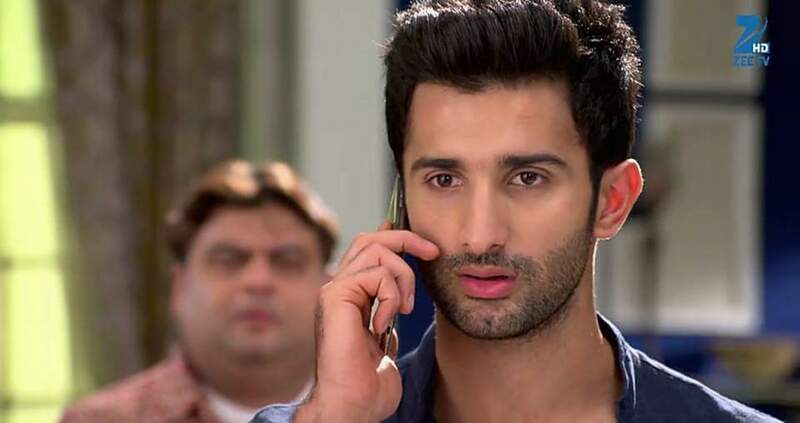 Kunj asks twinkle what happened? She says i am really worried. Kunj says don’t worry. There are so many people here, he can’t do anything here. Yuvi and mahi are on stage. A man thumbs up to yuvi. He hooks side of Mahi’s sari in the fan. Yuvi asks mahi to stand up. Twinkle sees it. The fan turns on, Mahi’s sari unrolls. Everyone is dazed. Mahi covers herself. Precap-Twinkle says to kunj I warned you not to play with my sister. Yuvi says how dare you think I would do this to mahi. Kunj slaps Yuvi and says don’t talk like that to twinkle. Mahi says jeju you have no right to insult yuvi. .